I had the most remarkable experience in a bank. My handsome husband has done a very brave thing and faced down the terrifying face of Ugandan bureaucracy. He has opened his own business and it has been registered by the Republic if Uganda. Are you impressed yet? In order to do the above, a large amount of research and driving around had to be accomplished, a lawyer of fine standing and hopeful efficiency had to be found and money had to change hands. He also had to open a bank account. It was this final part that was proving the most frightening to us and we had the night sweats just thinking about the paper work, the potential broken photocopiers, the refusal on some grounds that we had ever considered, all in all we were worried. We even set aside an entire morning to complete the act. I had to go along as my signature was needed. And we would reach out our finger and point it out to him. Every time he asked for a document, photo, passport or any thing he could think of, we handed it to him. Finally, and only 15 minutes after entering the bank he handed us our paper work and shook his head. “Never in all my years have I seen someone come with everything. Everything! Amazing.” He shook his head with surprise. I think now and again it is good practice to celebrate the things that work and the times when it all goes just to plan. After all, wherever you are, it is such a rare thing. It would have taken longer in Montreal. No doubt. Men frequently hold hands with each other. This does not mean they are gay. In fact homosexuality is an offense punishable by a life in prison. Aids is rampant but it is really a middle class disease. They were many wild parties back in the 80’s among the monied classes and the price is still being paid today. Museveni, the President of Uganda, has been in power for 24 years. He holds a firm grip on this position and the 2011 elections will be very interesting to watch. It is almost impossible to run a business here without some slipping of notes under the table. There is no govt. run garbage collection. Garbage is dumped on the side of the road for the cows and the Marabou storks to peck at. People here are Premier League soccer fanatics and even in the remotest village, games are shown in town halls. 30 million people know who Rooney is. Warangi is the local liquor. It is made of banana, sorghum or millet malt and people have been known to go blind from the strong, unregulated stuff. There are Super Campers and then there is me. 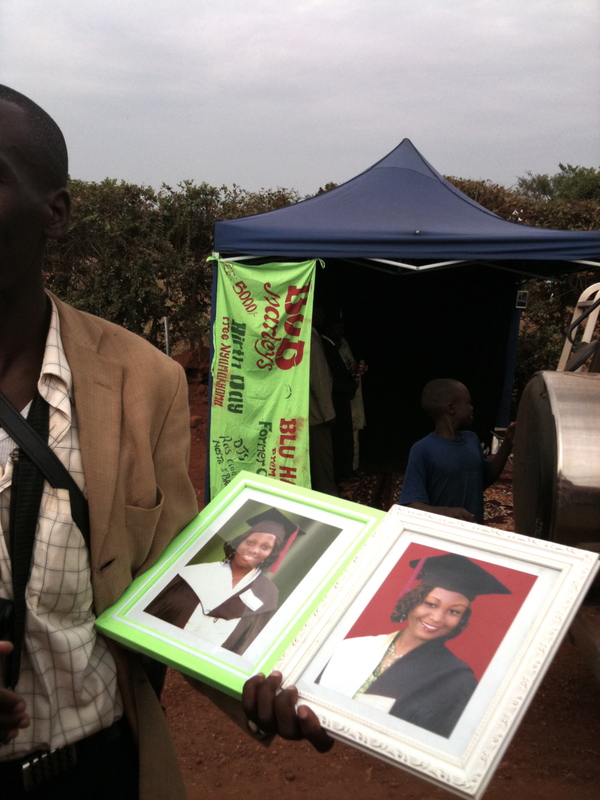 We were in Sipi with three other families so each night at dinner we were 15. The children ranged in age from 10 to 15 with only 3 boys yet they were all in sync and ran about like fair nymphs of the forest. Two of the families brought their tents and camped, one being the family I have previously referred to as The Super Campers. Well now I have met two Super Campers. They both arrived and strenuously put up tents, blew up mattresses, arranged tables and chairs, unpacked mini stoves, kettles and thankfully wine, cashews and olives. While I was ordering hot water for tea and hot chocolate, there they were boiling water and playing with stackable pots. It was a remarkable thing to see from someone who is definitely not a camper. I couldn’t fathom why someone would go the trouble of camping when there were perfectly decent Bandas merely feet away. They tried to convert me with the largesse of their tent and the comfort they felt, but I could see no comfort in sleeping like a row of sardines with my daughter’s elbow in my face. I guess it takes all sorts and I know that I am on the side of the non campers, unless I am in a place where one must camp by necessity, as we did in Murchison. However, Trooper and Princess think Camping is a GREAT idea and why are we so boring sleeping on beds?? 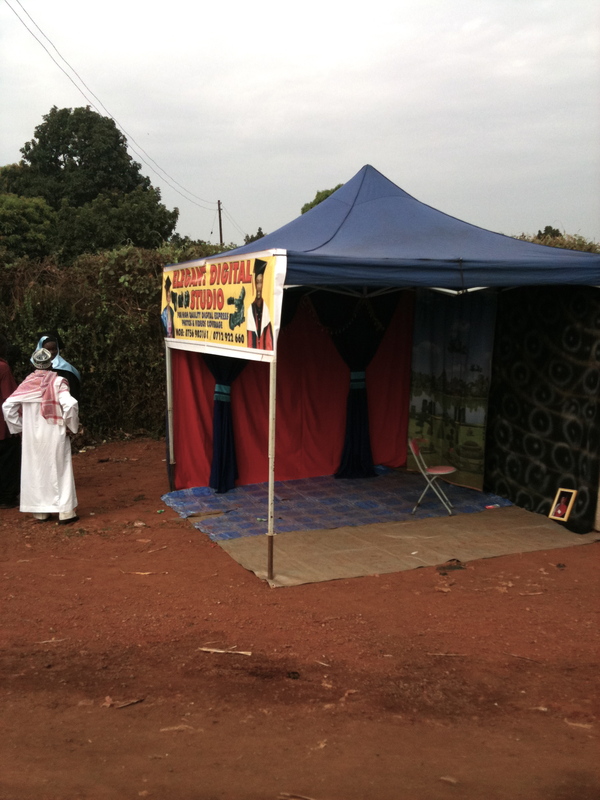 On the way to Sipi falls we passed through Graduation day at the nearby Islamic University. Proud graduates in gaudy outfits that peeped out from beneath their gowns were having their photos taken in portable photo booths resplendent in shiny back drop, flowers and tacky signage. Photographers were plying their trade by showing framed protratits of previous graduates to anyone of the hundred or so people that walked past. It was a colorful and busy scene and I felt like an observer to a totally foreign world. The chasm between our world and theirs is wide. It can be heartbreaking to walk past such poverty and to repeatedly hear the appeals for sweets or money, to see young boys whose trousers are more holes than anything, whose shoes are broken plastic. 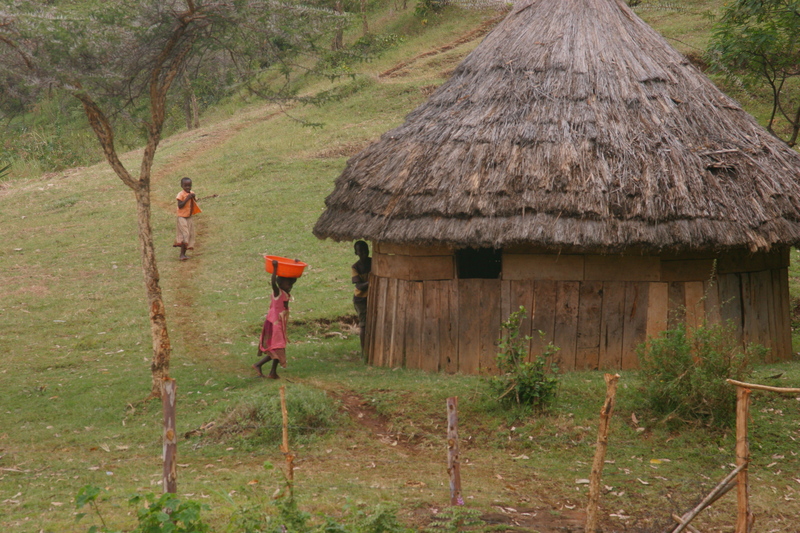 By virtue of necessity our hearts form a thicker layer as we pass their mud huts where they tend chickens and goats or carry firewood to cook their one meal of the day. We live here so we cannot afford to be sad everyday, and we cannot fall into the trap of handing out shillings to each and every child. It is complicated; this us and them reality is something I face every day. 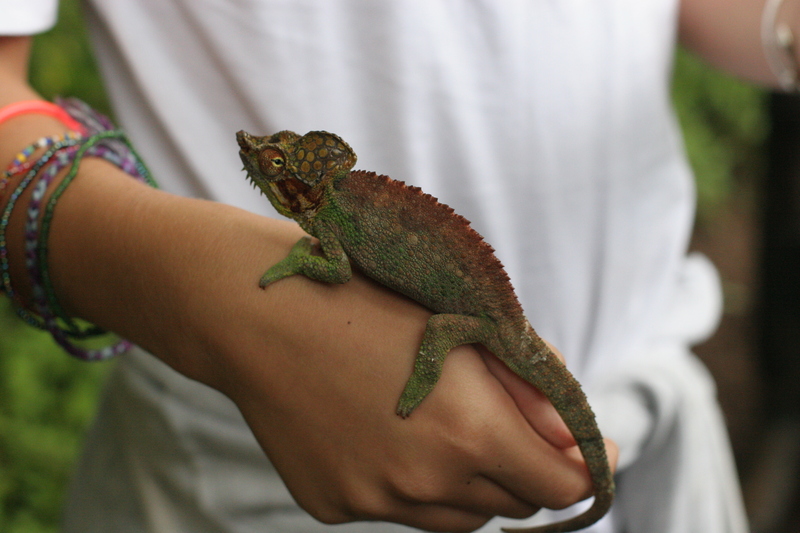 It felt like Chameleon weekend at times. In total Princess asked me 6 times if we could take “just this one” home and keep it as a pet. Have I mentioned how pretty it was? Like water nymphs, they frolicked in the spray. 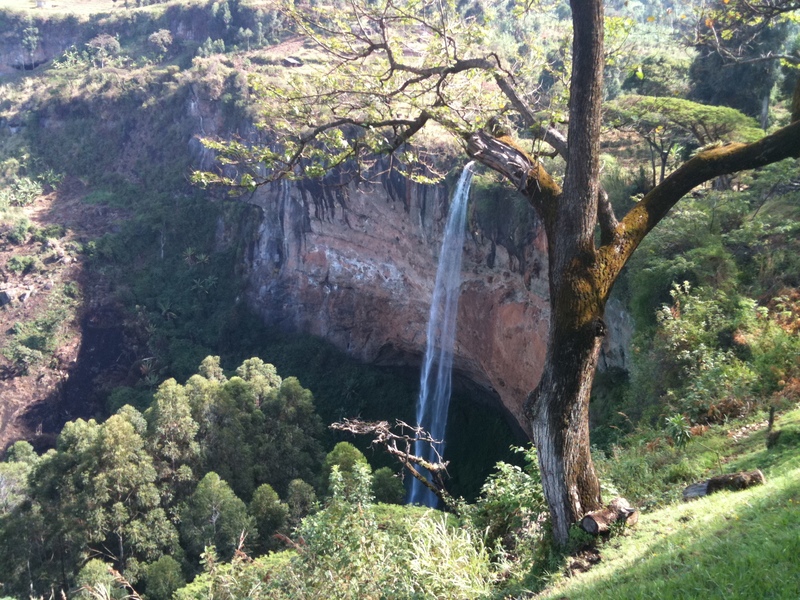 Sipi falls is 5 hours East of Kampala. It is a place for hiking, relaxing and gazing at the splendid scenery. When we reached Sipi the first thing that struck us was the view. 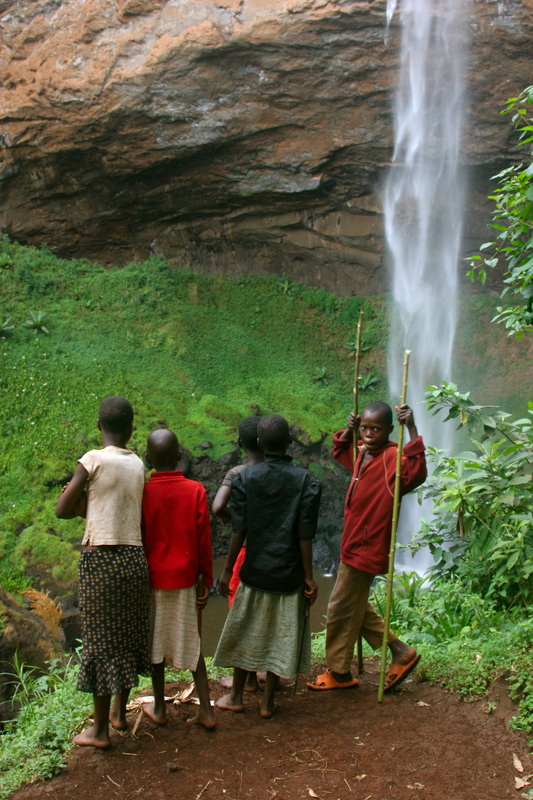 Thankfully, there are no mosquitos in Sipi as it is 4000 meters high, the air is clean and the sound of running water is always present. Three nights and four days is the perfect amount of time for a mini get away. You return to the regular life restored. How long that feeling lasts is another story.. 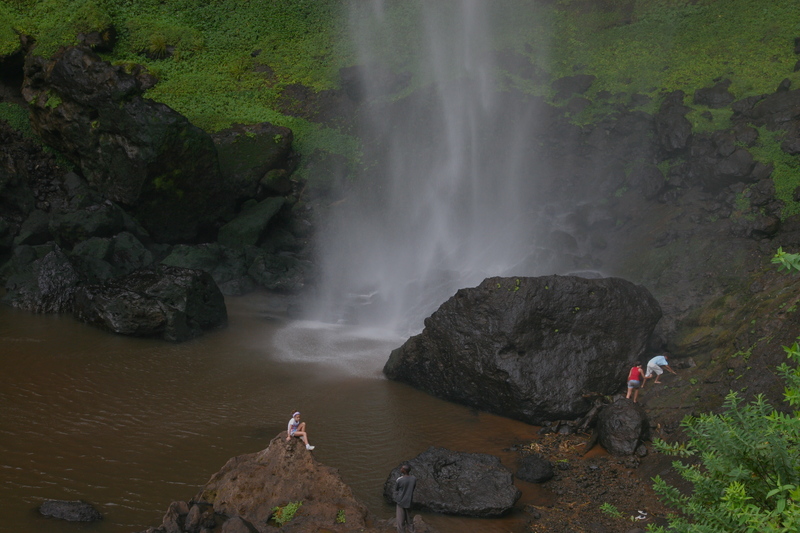 There are three main falls in Sipi and they are not magnificent for their strength, power or sheer volume but rather they are very pretty by virtue of the extreme height of their fall. Our lodge was perched on the very edge of one of the falls. Our room, made simply in a rustic style, had beds built high enough to see the view from the comfort of our bed, it was not luxurious, but, it was all one really needed. 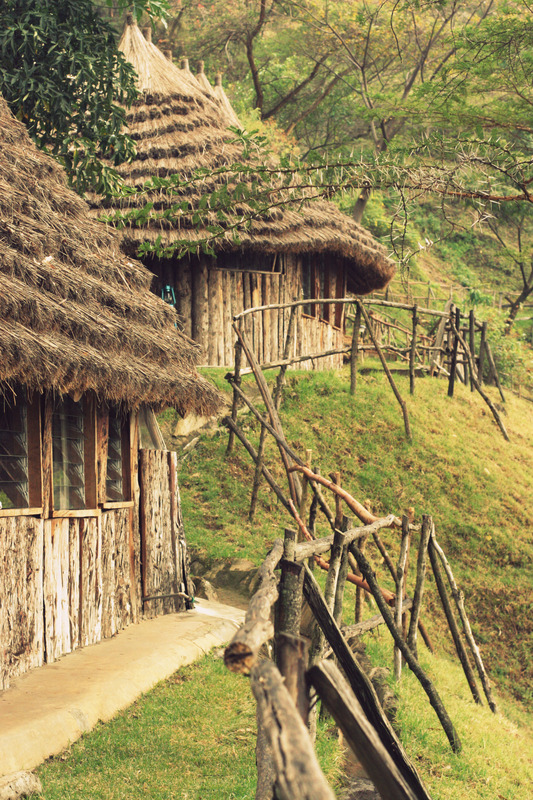 Like a little log cabin with thatch roof and knotty logs of wood for beds, each Banda was a brown dot in an otherwise stunning cliff top ridge. The falls were tucked under us, so, hard to see but we heard them and all Bandas and the restaurant faced an enormous valley hugged loosely by two tall cliffs. It was as if child, had, in an inventive moment laid a soft map of the world over two upturned chairs . The sky became huge as it spread itself above this valley, occasionally forming square shadows with it’s clouds. When we arrived we set off immediately on hike number one. It is an hour and half hike to the bottom of the falls directly under the room we were staying in. But with three children 10, 12 and 12 who wanted to stop and admire, pick up and adopt every chameleon we passed and then stand under the spray of the falls , it took closer to three hours. The path took a winding route that passed a few mud homes, some cows and down past caves that looked like giant and deep scars in the face of the cliff. We then passed coffee trees that gave us some cool shelter before we came out and climbed down a giant steep ladder, kindly constructed so that between a choice of sliding on one’s bottom down a 90 degree mud wall or walk backwards down a shaky and steep ladder, we could choose the latter. By this point in the walk a few local children had decided to tag on. When we finally got to the bottom of the ladder after and slow and careful walk down, one of them just walked frontwards down the ladder as if it were a simple and dull flight of stairs. His friend chose the mud wall option, only he ran gracefully down. Soon we arrived at the foot of the falls. Having passed through grass, mud, rocks and ladder we were now in a tall grassy field. As we passed through, the falls began to roar. We could see them before we felt them but once we climbed down some cool rocks we could feel the spray that came so suddenly, with a gust of air that literally took my breath away. The walk back up the cliff hurt, and still hurt the next day. Shows how dreadfully unfit I am. Shameful, especially considering the number of women we passed who climbed that path and that ladder daily, with huge stacks of wood on their heads. Children become completely alive and vibrant under a waterfall. The joy of such abandonment is a thrilling thing. It is rare that I feel such unmitigated joy, such freedom to live completely in the moment without a care for tomorrow or even today. They are so lucky my children. In the past few days they have laughed with friends, had tickle fights in a tent, climbed hills, twirled in the spray of a beautiful waterfall, captured chameleons, run in nature and played. Played with each other and the space around them. Kampala is a far life from here. I am off in search of fresh air and nature. I am leaving the little box, the sauna classroom, the pubescent school sprogs, the red dust and the 6.25am alarm that so rudely pulls me from me slumber, behind. It is only a four day escape but it will be adequate, I believe, to charge my tired spark plugs. 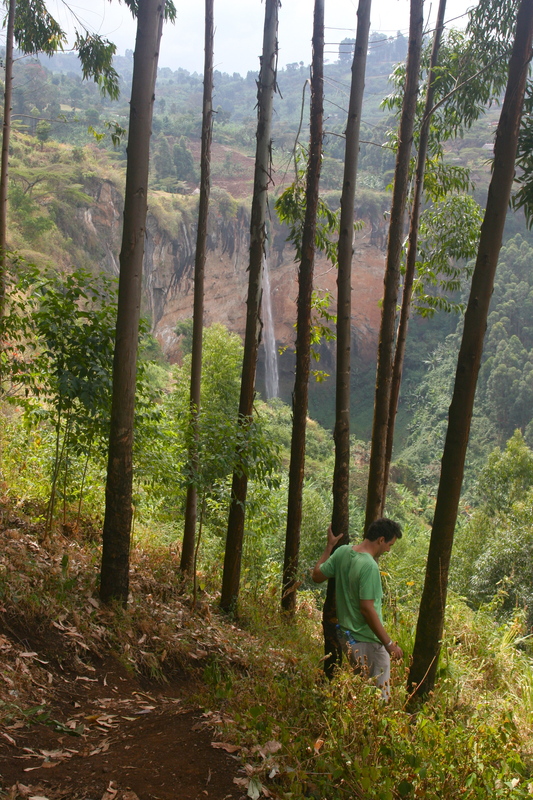 We are going to Sipi Falls which is near Mt. 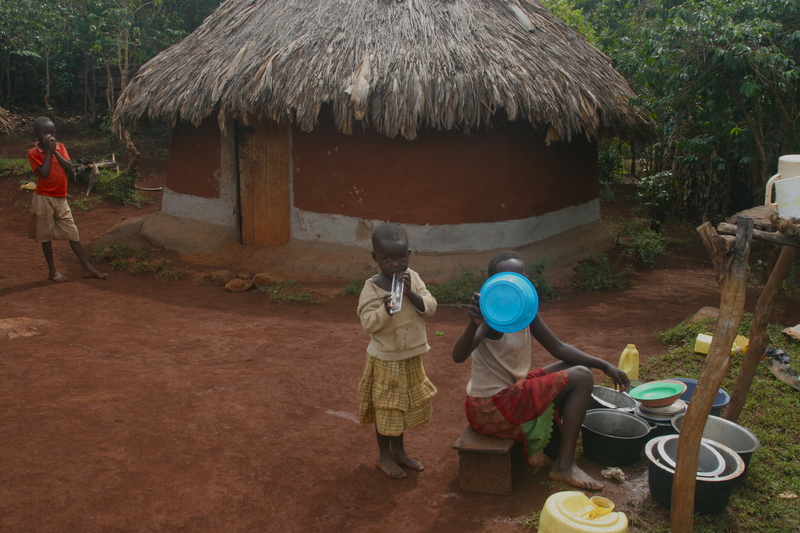 Elgon, quite close to Kenya and 5 hours east of Kampala. It will be our first time heading east and I think Beauty will love the ride. Apparently there is a remarkable waterfall and some stunning hiking. I really have little idea what it will be but I promise to return with stories and photos. I think it is time for a teaching post. It seems all I do at the moment is teach, teach, teach. Most of the time I don’t actually feel like a teacher; in terms of the fact that I assume most teachers feel and look like teachers, whatever that means. No, most of the time I feel like a photographer, a writer, a mother, a wife, a friend; and then I remember that I am a teacher, and that I love it. Some days are magic, everything works, the cogs feel oiled and everything simply rolls into place. Other times there is a sticky sort of feeling between me and the kids. They don’t want to be there, neither do I, they are wild, I am not, they make a noise or a mess, and I lose my patience. Reports and marking are not my idea of fun. Meeting parents? Not so much fun. Standing on a chair to tell a story? Might be fun. My philosophy these days is simple. When teaching people who are going through puberty you simply need to keep them AWAKE. Or ENTERTAINED. Their minds must be swayed away from their pants. Therefore I must not be boring. Kids only learn if they are aware. At the moment I am awash in projects. I have little patience for boring teachers that simply do exercise after exercise with little imagination of inspiration. I stay on the syllabus, I do, but once in a while I take a leap and land in some gentle field of poetry. Right now we are writing our own Poetry Books. The deal is this. 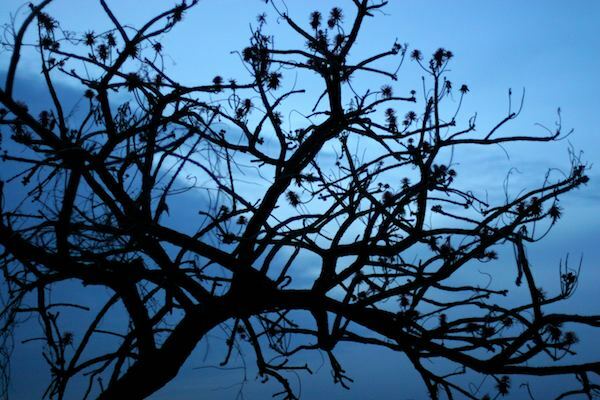 Three poems by the student, one by a famous poet, a gorgeous cover page, a page typed analysis about the chosen poem and all four poems need to be illustrated in a manner that reveals the theme of the poem. I think it will be fantastic. We are also writing short stories based on a photo prompt that comes from the best photos of the week on a popular news website. These stories will be peer edited by at least 3 peers before I finally get to see them so I am hoping desperately that all people will consider themselves an I and not an i, that proper things will be CAPITALIZED and that sentences end in full stops. It is the simple things I am after. If we get some real quality fiction, that will be a bonus. Another exciting project on the agenda is our class Newspaper. I teach 6 classes of 20 students each so it should be fun to see what they come up with. They have all been assigned journalistic roles and with the kind help of the IT dept they should be pretty and perfect by the end of this week. I am strangely optimistic. Last but not least they will all be receiving their big term projects this week. This time round we are doing Biographies. They need to choose a person they know; so no danger of reading plagiarized reports of Obama over and over again. Now just think of the marking! When will I have time to do all the other things that keep me ticking?